JEE Advanced 2019 Exam dates and timings 2019: JEE Advanced 2019 Exam dates, JEE Advanced 2019 Exam Schedule, JEE Advanced 2019 Exam timings 2019,JEE Advanced 2019 paper 1 and Paper 2 Exam dates and timings 2019. Indian Institute of Technology (IIT), Roorkee has released the Schedule of Joint Entrance Examination Advanced (JEE Advanced) 2019 on its official website: https://jeeadv.ac.in/. Due to the General Elections 2019, the examination date of JEE (Advanced) 2019 has been shifted to May 27, 2019 (Monday). 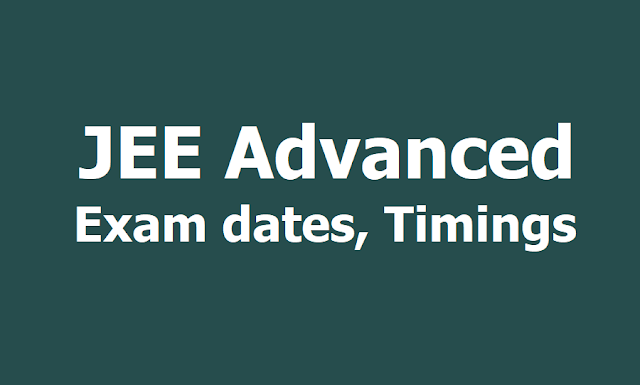 JEE Advanced 2019 examination will be held on May 27, 2019 in India and abroad, on May 27, 2019 (Monday), in the two shifts: Paper 1 (09:00 to 12:00 IST) and Paper 2 (14:00 to 17:00 IST). As per the schedule, session 1 will be conducted on May 27, 2019, in the morning shift i.e., 9 am to 12 pm. Session 2 will be from 2 pm to 5 pm. The date of the admit card for the exam would also be updated on the official website. The candidates need to login to the official website to check and download the JEE (Advanced) admit card 2019. The entire JEE (Advanced) 2019 Examination will be conducted in fully computer based test mode. The candidates can check more details on the same from the official website of the exam. IIT Roorkee is conducting JEE Advanced 2019 under the guidance of the Joint Admission Board (JAB) 2019. The candidates who qualify JEE Advanced will form the basis for admission to the Bachelor’s, Integrated Master’s and Dual Degree programs (entry at the 10+2 level) in all the IITs.